Are you putting enough effort into your titles? Writing a superb article may not be enough to gain exposure, build credibility, and increase traffic. Before readers and publishers read your article, you have to hook them with a compelling and descriptive title. Fall short of a great article title and you may have wasted the time you dedicated to your article body, Resource Box, and your website. Why? Competition for your reader’s attention is fierce. In addition to the 10 results displayed per search engine results page (SERP), there are the ads that also vie for your reader’s attention. 15 minutes = 900 seconds; 900 seconds divided among 500 people = 1.8 Seconds of Your Time and Effort per Person! That is why I say that it might seem a little slow and frustrating at times when creating a good headline, but that effort is actually very small for each person who will see it. … I would consider 1.8 seconds per person to be a great investment! Save writing time and gain dozens of ideas with free optimized title suggestions! Check out Increase Your Exposure and Traffic with Prewritten Titles. It’s true that Title of Article is crucial to induce the visitor to read the entire piece. A well-written article title is not only important because it will attract potential readers but also because it is the single most important on-page element that Google considers when ranking your article in its search engine. However, you should keep your title to 60 characters or less not the 65-70 mentioned above because Google only indexes the first 60. Good title is a main board for visitors, how you introduce your content depends how you write suitable title for your content, so this is really valuable information which all internet marketer should know. I spend a lot of time crafting my headlines. I make sure it has both or either long-tail as well as in active voice. Based on experience, it increase CTR and lowers bounce rate… Of course, if the article content is interesting and informative. If the article would attracted to people, the title is very important. I am writing title for my site, when i know exact of what really should visitor want to see and how they are finding suitable information, how they write title to find needed information of what they want really. it’s sometimes difficult more then post of how to write exact title for your post. I find trying to write a catchy title is hard. I am now writing the articles first and then thinking of a title that will draw people in. If the title doesn’t get you to read the rest of the article, it really doesn’t matter what you wrote. I strive to make my article titles no more than 70 characters. It really is a copywriting job when it comes to writing good article titles. The more you learn about how to write good article titles, the higher the chances are at having people click on your website in the search engines. 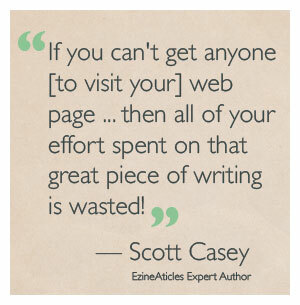 Thanks for the helpful tips, having a title that draws your visitors in is half the battle! Titles are important not only in that it’s seo applications within your own life. To attract customers to the first thing I need is a title that summarizes the needs of customers, generalize their products. Writing is tedious. So it matters the efforts invested in it, is considered meaningfully. Nobody will waste his/her time reading an article which does not provide the need or want for him /her. Articles to be attractive comes right from the heading. A brilliant content can miserably suffer rejection from readers, if its header fails to attract them. It’s important to creatively put heading that can attract; hence provide significant benefit to the writer.